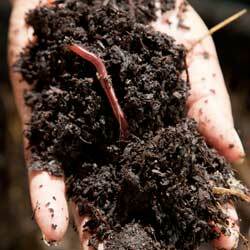 Have you tried vermicomposting, otherwise known as worm composting? This simple process mixes food scraps with yard waste and other organic materials in an enclosed area containing specific types of worms. The worms (and associated microorganisms) eat the organics and turn them into a beautiful light and fertile soil amendment. This compost is almost magical! It’s packed with nutrients, improves soil structure, increases drainage and appears to improve plant growth while decreasing pest damage and plant diseases. Not only environmentally friendly, vermicomposting doesn’t require much space, is inexpensive and easy, and it’s a fun hobby for the entire family. The two recommended worms for vermicomposting are Red Wigglers (Eisenia fetida) and European night crawlers (Eisenia hortensis). The latter grows bigger, eats coarser food and may be heartier. They each eat their own weight in food every other day. Do not use native earthworms, as they do not live well in bin conditions. Most people begin with 1 lb (16 ounces) of worms. These will eat 8 ounces of food every day. When you know your amount of food debris, buy twice as many pounds of worms. For example, if your average daily food debris is 1 pound, order 2 pounds of worms. If your average daily food debris is 4 ounces, order 8 ounces of worms. Your worms will need a comfortable place to live. Provide a bin with a surface area that equals the weight of the worm order. In other words, if you order 2 pounds of worms, your worm container will require at least 2 square feet of bin surface (but should be larger). This could be 1’ wide by 2’ long. Use non-treated wood, plastic, rubber or galvanized bins. A larger container houses more worms to compost more material. Worms do not burrow deeper than 24” therefore the bin should be less than 24” deep. The bin needs a removable cover to protect from rain, light and drying out. Remove it if the bedding becomes too wet, but place a screen across the top to prevent worms from escaping. If needed, use a moistened strip of burlap or canvas to add moisture to the bin. Unless using wood, which is naturally porous, provide ventilation in your bin by drilling 12-18 1/8” holes on all four sides. Drill holes on the bottom to prevent your worms drowning if moisture builds up. Remember, your worm population will increase. When sizing your bin, allow an additional 40 percent of surface area for the increase in addition to the initial population’s requirement. Where you put your bin should be convenient for both you and your worms. Elevate the container on bricks to improve ventilation and drainage of excess moisture. Place the worm bin where it will not receive direct sunlight. In a shed or garage, under house eaves or other shade structure to maintain a temperature above freezing and below 85 degrees is perfect. In the winter, prevent freezing and insulate with sheets of foam on the top and sides, add a heating pad to one side, or move inside a building if needed. Before adding your worms, you will need to add bedding to the container so they have a place to burrow. Soak and squeeze out the excess water from shredded fibrous materials such as newspaper, egg cartons or single-layer cardboard boxes. Mix in dry grass, brown leaves and/or straw. Add sawdust or aged manure, if available. Cover with a thin layer of well-moistened soil. This bedding will give your worms a great start and will help feed your compost. Until your worms begin multiplying, only feed them once a week by adding a small amount of food scraps. Chopping or breaking food into small bits helps the worms eat the scraps faster and reduces any smells and fruit flies. Mix the food lightly into the bedding on one side of the worm bin. Ideal foods to offer your worms include eggshells, non-citrus fruits, coffee grounds, unbleached used coffee filters, leafy green vegetables, rice, grits and vegetable scraps. Do not include meat, fish, oily scraps, fat chunks, bones, dairy products such as milk or cheese or cat or dog waste. Avoid eucalyptus leaves, as these contain a natural insecticide which could kill the worms. Additionally, if adding lawn clippings, be sure the grass hasn’t been chemically treated. Green foods such as leaves, vegetable tops and green grass add additional nitrogen to the finished compost. Eggshells increase the calcium in the final compost and brown foods such as paper, wood chips and leaves increase phosphate and carbon. The more varied your worms’ diet, the richer your compost will be. When the worms begin to multiply, provide a weekly quart of food scraps per square foot of surface area. If your bin is 2’ square, provide 4 quarts of scraps per week to nourish your worms, but avoid overfeeding. One way to tell if you are feeding too much is by smell. If it smells bad, food is rotting instead of being eaten. Reduce the amount of food going into the bin until the smell disappears. When adding food, be sure to check the amount of bedding. The bin was full of bedding when the worms were added. When reduced to half, add more newspaper or cardboard strips, hay, straw, etc. Check the bin every other day and moisten the material, if needed. It should be moist but not wet. Note that the types of scraps you add will contribute to the moisture in the bin, and you do not want any puddles or sopping that could suffocate and drown your worms. Your worm-assisted compost should be ready in 4-6 months. The easiest way to collect the compost is to scoop out small piles of the material and place onto a flat surface. Remove as many worms as possible and return the un-composted materials and worms to the bin. You may use a wire mesh netting as a screening device. Add more bedding and let the cycle begin again. After removing the worms and chunks, what’s left? The grand prize of worm castings (poop)! This is the “magical compost.” Some people even call it “black gold” – it’s that fantastic for your garden. Raising worms and producing your own super compost is easy and fun. Plus, it removes food waste from the local landfills and enriches your garden. What’s not to love?